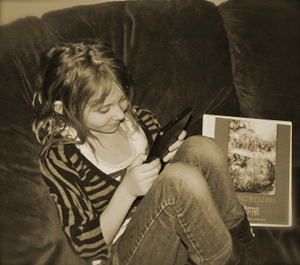 The Young Readers Classical Curriculum was created especially for families with elementary aged students. We took the shortest, easiest selections from each of our other libraries and put them in one Library so novice readers can access all of our easiest-to-read books. 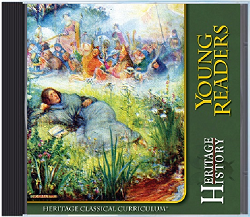 The Young Readers collection is the introductory unit of the Heritage Classical Curriculum. It includes easy-to-read, introductory selections from many historical periods and provides a broad introduction to Western Culture suitable for grammar school age students. Specially featured are short stories from American, European, Ancient, and Biblical history. The Young Readers collection is a good option for families that want to keep children entirely off the internet. Illustrated texts of 86 books, including both printable PDF and e-book formats are provided. Also included are beginner-level timelines, character lists, and reading recommendations. .
Just click on CD cover Above to access over 80 Classical Children's Histories. The Young Readers Classical Curriculum represents a broad and age-appropriate introduction to all of Western Civilization. Primary subjects include American, European, Ancient and Biblical history. The selected books touch on many important events in Western history, in a child-friendly, easy-to-understand manner. Instead of trying to cover history in sequence, students are introduced to an assortment of characters, and can focus on those incidents of greatest interest. By the time your student outgrows the Young Readers collection, they will already be introduced to all the major periods of Western Civilization. All of the books in the Young Readers library can be read by an older grammar school student, but they are also appropriate for read-aloud to younger children. And although the stories are told in simple enough terms for a nine or ten-year-old to understand, they are engaging enough to be of interest to older students as well. The Young Readers library is one of our largest collections, with over eighty books to choose from. Many of the books in this collection are simple enough for a fluent reader to complete in only a few hours, so avid readers may be able to read dozens of books from the collection before moving on to more challenging curriculums. Reading a few dozen of these books will expose students to hundreds of famous historical characters and will be an excellent foundation for future learning. Most students who are just learning to read fluently are not ready for comprehensive history, and prefer short, engaging history stories about fascinating characters. The books in Heritage History's Young Readers library are a perfect fit for such students: they were written to pique a child's interest rather than provide a general overview. In addition to short histories, the Young Readers collection includes legends, adapted literature, historical fiction, and short biographies. Such books provide an excellent transition from children's fiction to serious historical works. Reading even a fraction of the books in this collection will expose students to hundreds of famous historical characters and will provide an excellent foundation for future learning.